The sunflower. A surprising strength, this optimistic flower rises up from the ground, turning its petals toward the sun. It breathes life into its presence. Bright. Radiates happiness. Sometimes, when you least expect it, just like love, a book or series throws a curveball your way. 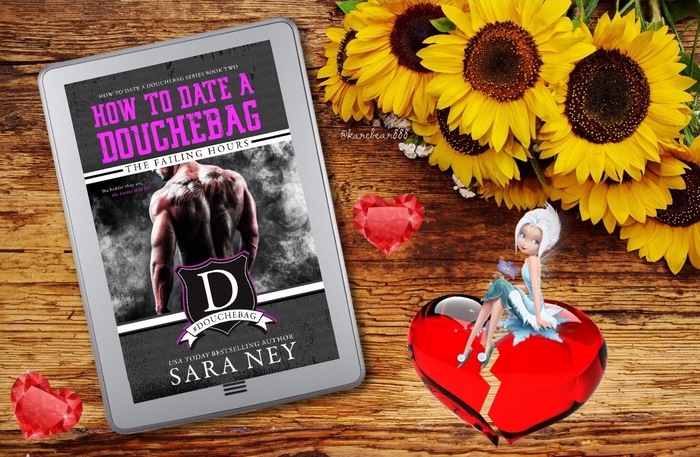 Sara Ney’s How to Date a Douchebag series was my curveball…my SWEET SURPRISE. 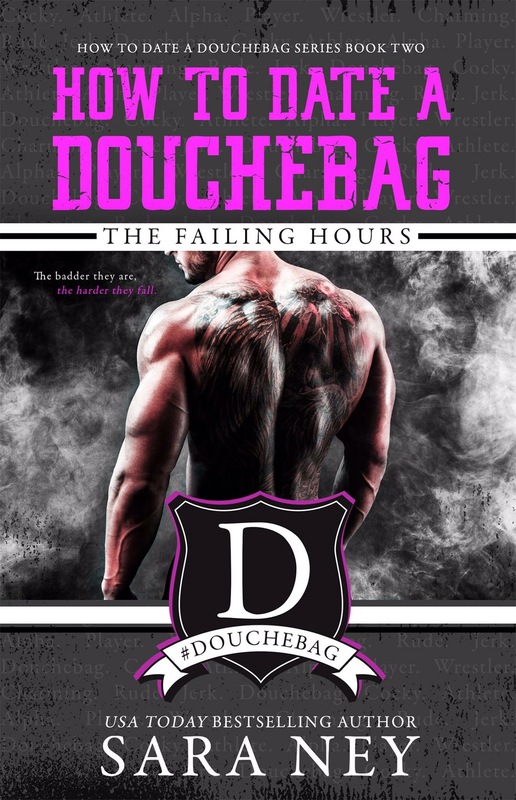 This series and latest story, How to Date a Douchebag: The Failing Hours, snuck up on me, SEIZING ME unpredictability like love, and STEALING MY HEART. I became one with this Douchebag, DRAGGING this book everywhere I could go with my kindle. I did not want to stop the RUSH felt while reading. So I held onto this high, this EUPHORIC HIGH from the DRUG I devoured called How to Date a Douchebag: The Failing Years, serious WORD CRACK by Sara Ney. My friends call me merciless; they claim cold blood runs through my veins, that I’m impossible to get close to. But I like it that way. Zeke wears a mask that I wanted to uncover…strip away that loathing and look for love. The most complex and completely frustrating of douchebags but broken alphas speak to my soul, and Zeke spoke to mine. Zeke…tall, built, brooding and beautiful. Oh is he one of the biggest, arrogant of arses…worse than a douchebag. God I’m a douchebag. I know this. But I can’t stop. Violet is a waif-like, ethereal beauty who is beautiful and kind though she has weathered so many storms. An angel who is light and life. A heroine so strong that I had to admire and adore her. I doubt she even likes me — no one does. Oh GAWD!!! This man!!! This man?!? Zeke tore my heart apart…this broken beauty…this big grinch…and my heart hurt like his. “Violet.” He sighs. Zeke is…He’s sighing my name. I want so badly to kiss his handsome, broody face all over. Kiss his deep frown lines away. He never had to say it with words; Zeke Daniels gets me. Looks past all my imperfections and sees that deep down inside, we’re kindred. We bear similar scars. I have a new Douchebag I love: Zeke. Zeke and Violet, opposites in looks and demeanor, are kindred spirits. These two shattered souls MELTED ME. Their…this story is bleeding angst meets heartfelt MAGIC. This love story is a SLOW BURN, a book that blasts all the emotions like an explosion. I laughed. I cried. I cringed. I smiled. I swooned. I fumed. I felt. I felt every word. I FELT IT ALL. However…God bless Oz for rescuing my tears with his humor. He was my emotional life raft. My FEELS flowed the whole time reading, this book blasting through me where it pounded my emotions like a wrestler to a mat. Light to dark…push to pull…angel to devil…this story tugged at my heart. Words—so powerful and poignant—reached in and HELD MY HEART where it both BROKE and BLOOMED. How to Date a Douchebag: The Failing Hours is stunning and strong, a heartbreaking and heartwarming story that is so much MORE than its title. This story is hard-fought love. This story is heart and healing. This story is a TOP 2017 READ. This story is EVERYTHING!!! I do. I CHOOSE Zeke, this perfectly imperfect douchebag. I choose this emotionally-wound story, How to Date a Douchebag: The Failing Years. I choose the ACHINGLY ADDICTIVE and PASSIONATELY POIGNANT writing of Sara Ney…EVERY TIME. I LOVED the Douchebags soooo much, and must meet Sara’s other masterpieces.